Gouvernement General d'Orleanois, ou se trouvent l'Orleanois Propre, le Blaisois, le Gatinois, et la Beauce, qui comprend le Vendomois, le Dunois, et le Pays Chartrain. 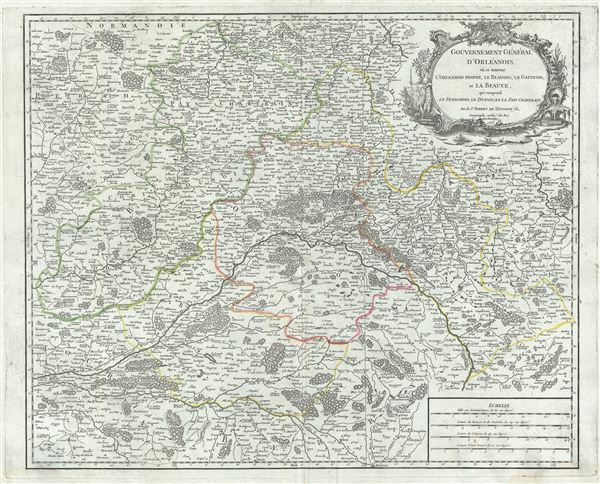 This is a beautiful 1753 Robert de Vaugondy map of the Orleans region in Central France. It covers from Corbeil-Essonnes south to Vatan and from Tours east as far as Sens and comprises of the Centre Region. It includes the whole or parts of the French departments of Loiret, Loir-et-Cher, Cher, Eure-et-Loir and Essone. Centered on Orleans, important cities of Sens, Tours, Chartes, Blois, etc. are also identified. The map renders the entire region in extraordinary detail offering both topographical and political information throughout with forest and mountains beautifully rendered in profile. Surrounding the city of Orleans, Loiret is considered the heart of France and is a registered Unesco World Heritage Site. This area of France is also part of the Loire Valley wine region, and is especially known for its production of Pinot Noirs and Gris Meuniers in the Orleans area. The Loir-et-Cher area is mainly known for its production of Selles-sur-Cher, a fine goats-milk cheese. Chartres in the Eure-et-Loir is home to the famous Chartres Cathedral. The map includes a beautifully engraved title cartouche in the top right quadrant. This map was drawn by Robert de Vaugondy in 1753 and published in the 1757 issue of his Atlas Universal. Rumsey 3353.028. Pedley, Mary Sponberg Belle et Utile: The Work of the Robert de Vaugondy Family of Mapmakers, 112.